Calling all water-lovers and families with adventurous members! Desaru Coast Adventure Waterpark, featuring the largest wave pool in Southeast Asia has been opened and operating in June 2018. 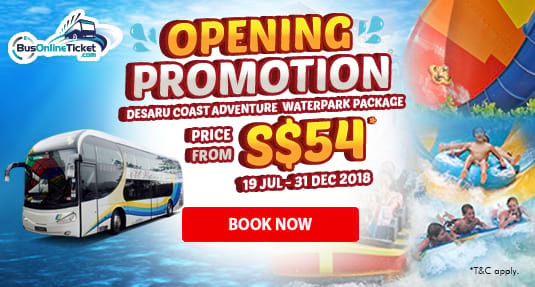 We can’t conceal our excitement to tell our customers that WTS Travel & Tours is offering online booking for their Desaru Coast Adventure Waterpark package promotion in BusOnlineTicket.com now! Desaru Coast Adventure Waterpark; one of the world’s biggest water parks, set against the backdrop of a Malaysian fishing village. In Desaru Coast Adventure Waterpark, visitors can experience the largest wave pool in Southeast Asia and the first water coaster in the region. There are up to 5 splash-tacular zones feature a unique mix of over 20 wet and dry rides, slides and attractions for everyone to explore. Desaru Coast Adventure Waterpark Package offered by WTS Travel & Tours is a combo service that includes 2-way bus ticket and 1 day entrance ticket to Desaru Coast Adventure Waterpark. This tour package is offered at a price from S$60.00 per adult and charged from S$54.00 per child or senior citizen. Please note that ages from 3 to 11 years old or up to 121cm in height is considered as child while ages 60 years old and above is considered as senior citizen. The promotion is valid from 19 July 2018 to 31 December 2018. The pick-up point and drop-off point in Singapore is located at Singapore Flyer. The departure time is 9:00am daily. At 8:30am, the passengers will assemble at WTS Office (unit number #01-06D) before travelling directly from Singapore Flyer to Desaru. For the return trip from Desaru to Singapore, the passengers will assemble at Coach Bay at 5:00pm. Planning to have a short getaway to Desaru Coast Adventure Waterpark with your families or friends? Book your Desaru Coast Adventure Waterpark Package at BusOnlineTicket.com and travel with WTS Travel & Tours now. You are advised to book your tour package online with BusOnlineTicket.com to have a peace of mind that your ticket is secured, especially during weekends or holiday seasons.